Rock Blackfish have a blackish-brown to grey body. They possess a dorsal fin (with 13 spines) that extends to the tail base. Their diet includes cunjevoi, red bait crab and cabbage seaweed. They are a tough fighter and a great sportfish, using their strong swimming tail to hide under rock ledges or in crevices. Maximum weight of approximately 9 kg and a length of 76 cm. 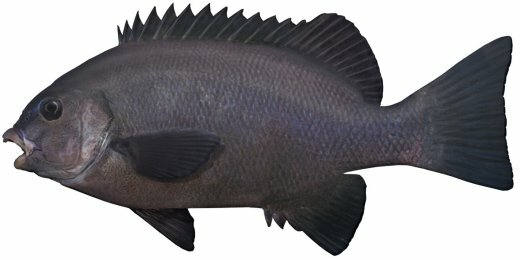 Eastern Rock Blackfish are found in surge areas of rocky shorelines along the NSW coast, as well as southern Queensland, Victoria and north-eastern Tasmania. Silver Drummer (Kyphosus sydneyanus) are found on coastal reefs in NSW, South Australia and southern Western Australia. They are distinguished from the Eastern Rock Blackfish by their silver colour and dorsal spine count of 11 instead of 13.